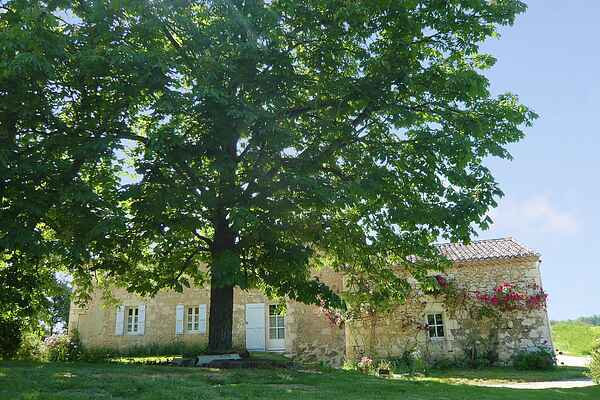 This old 19th century farm was entirely renovated in 2009 and is now a lovely holiday home. Hidden among sunflower fields, this house has a sunny lawn all around and a covered terrace. The interior of the house is neat and cozy. The old details bring back old times. Sports and relaxation can be found at the Lac des trois Vallées by Lectoure (9 km). Here you can go swimming, pedal boating and canoeing. You can also go for a trip by mountain bike or visit the thermal baths. In Lectoure there is also a supermarket, bakery and bank. Restaurant in Castet-Arrouy (4 km). 9-holes golf course in Fleurance (20 km). Or visit the impressive 16th century Gothic cathedral of Saint-Pierre. Or take a trip to picturesque Larressingle (40 km), also known as 'the little Carcasonne of the Gers'. With its beautiful round city walls, narrow secret streets and carefully restored house, this smallest city of France has also been crowned to be one of the prettiest cities in France. In the town of Condom (30 km) you will get to know everything there is to know about the history of the liqueur Armagnac at the Musée d'Armagnac.